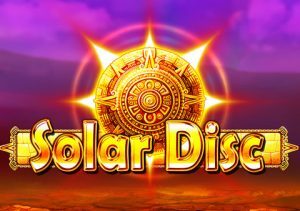 Pay homage to the sun god in Solar Disc, an innovative video slot from IGT. Played using a 6 reel, 26 payline game engine, it comes with special solar disc symbols that transform matching symbols into wilds. There’s also a free spins round where you’re guaranteed to land a solar disc on each of them. Stakes range from between 50p and £500 per spin. Unusually for an IGT-powered game, the action here takes place using a 6 reel machine. With a dusty desert in the background, the gold-edged reels are made up of objects from an ancient civilisation and a pair of higher value animals. You’ll see coins, keys, death masks and a chalice. The best symbols are the bear and the big cat. Both of these will get you an award of 5 times your bet if you manage to land 6 in combination. The most important symbol is the golden solar disc – when this hits, it reveals a standard symbol. All examples of this symbol anywhere on the reels on that spin then transform into wilds. A payout is then made with all the new wilds in place. If you’re really lucky, you can hit multiple solar discs on the same spin which can turn even more symbols wild with results to match. This is the Solar Disc feature. Land a spin that features a Bonus symbol on reel 1 plus a solar disc anywhere else on the reels and you’ll activate the Free Spins Bonus feature – on offer here are 10 free spins. The added wrinkle is that a solar disc is guaranteed to land on each and every one of them to deliver plenty of potential extra wilds. We’ve not always been big fans of IGT video slots as they’re a bit hit and miss. This is certainly one of the developer’s better efforts. The design isn’t quite from the top drawer but is decent enough. What makes the game so attractive are the transforming solar discs. The volatility isn’t quite as scorching hot as you’d expect from a video slot called Solar Disc. The medium variance offers enough to keep things interesting though – and wins of up to 500 times your bet on every spin. If you fancy a game that looks good and delivers something unusual on the features front then Solar Disc is worth investigating. I also recommend you try Apollo God of the Sun by Novomatic which is more volatile.